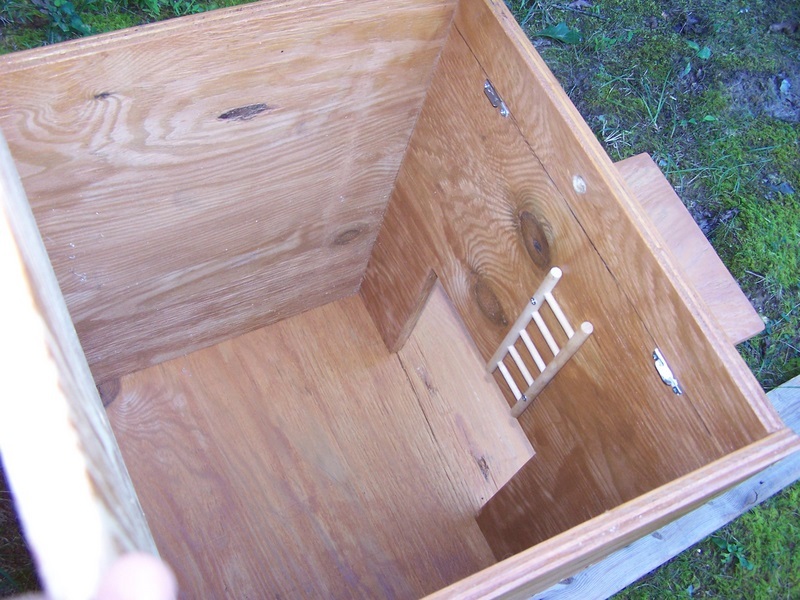 Sandy said build me a nesting box for a barred owl. I found these plans at University of North Carolina – Charlotte and finished installation in September, 2010. Here’s how we did it. 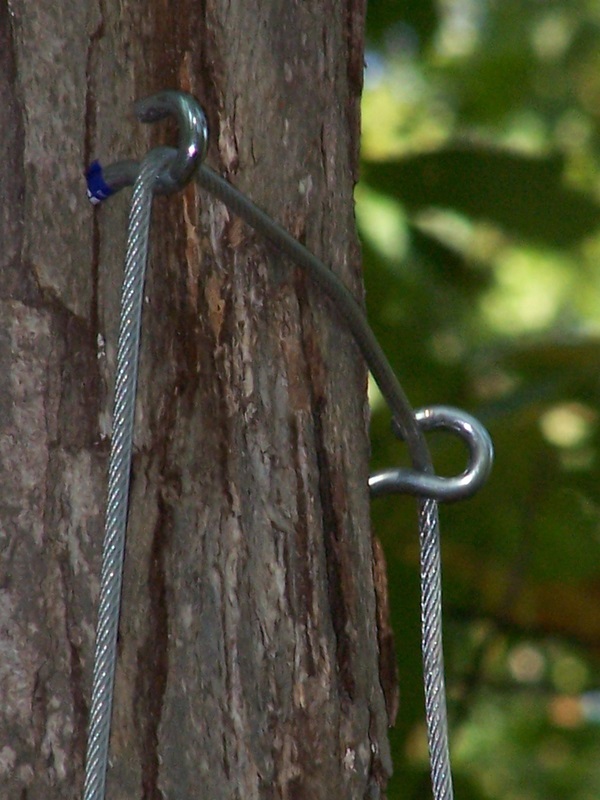 On the tree about 20′ above the ground, we added a pair of 1/4″ screw-in hooks about 18″ apart. We banged in a heavy nail centered about 3′ above the hooks to temporarily hold a pulley, and used a 100′ x 1/4″ steel towing cable with a big hook to hoist the box up the tree. (I imagine a 50′ nylon rope would have been sufficient, and easier to handle.) As the box was now suspended from the top of just one wall, the box leaned away from the tree 15″ or so at the top. 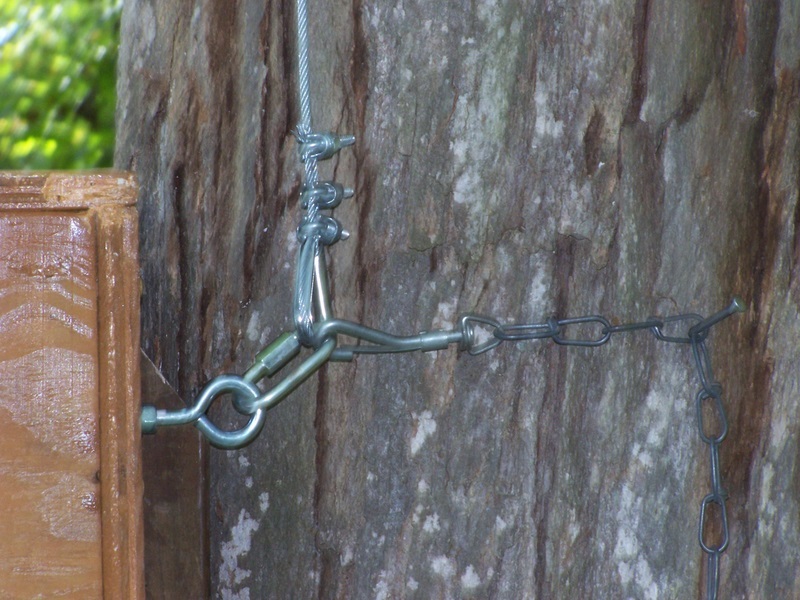 We then attached a bit of dog chain to each eye-bolt and a nail to each side of the tree to pull the box straight. 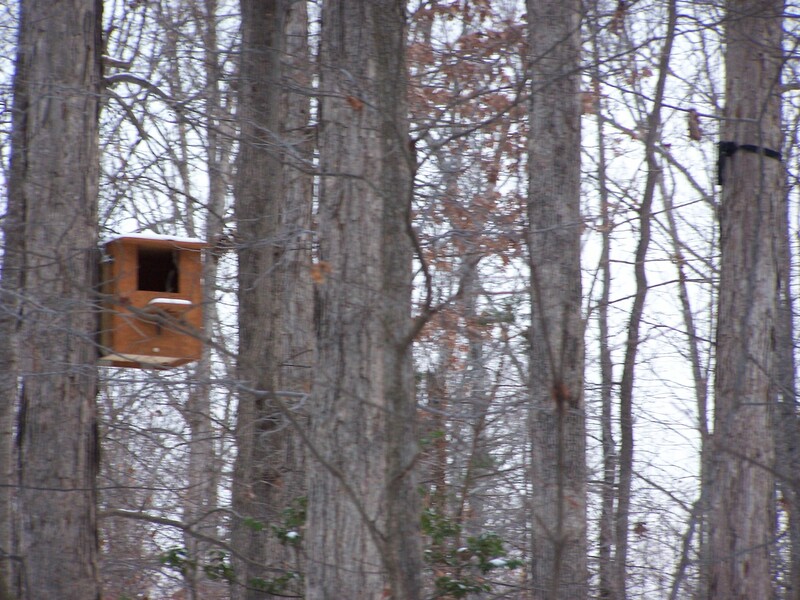 The box is located between 16′ and 18′ high on the side of a 70′ white oak, with its back to the direction of most of our rain. There’s 100′ of undisturbed woodland in every direction, beyond which are driveways, two houses, and a residential street within 200′. There are two ponds within a half-mile and a lake within two miles. Thanks be to Tim, who did the heavy lifting, and not just once, but three times. 10/10/2010: I only used a single L-bracket under the front stoop because I only had one handy. This was a mistake, as adding two brackets now will be cumbersome. When I do that I should also put a few holes in the stoop for drainage and traction. 10/15/2010: The plans predict having a strip of plywood left over after cutting the walls and roof, and using that to make a little step inside the doorway for the owlets to perch on to look out more safely. I overlooked that, and expected that my roof would therefore overlap the walls a little. But it fit perfectly. I hope the hamster ladder will be a satisfactory alternative. 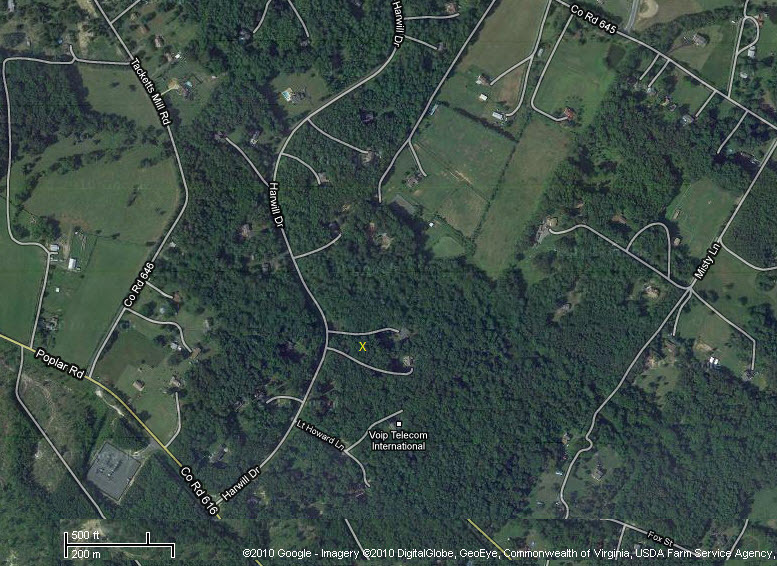 10/17/2010: This satellite photo (click to enlarge) has a yellow X approximating the location of the nesting box. There’s a pond 500′ to the NNE. Dark green for woods, lighter green for meadows, white for public streets and some of the driveways. 10/26/2010: So who is this barred owl? Hmm, well, we have seen an owl from time to time in the decade we’ve been here, either in poor light or at a distance. We hear owls much more commonly, but sometimes go months without hearing any. Those we do hear have quite different calls, and we think the same owl has a variety of things to say. We often hear the “who cooks for you” call which we know to be unmistakable as the barred owl, and we hear that somewhat more frequently than the calls we assume to be the great horned owl. See owlpages.com for their notes on the barred owl. 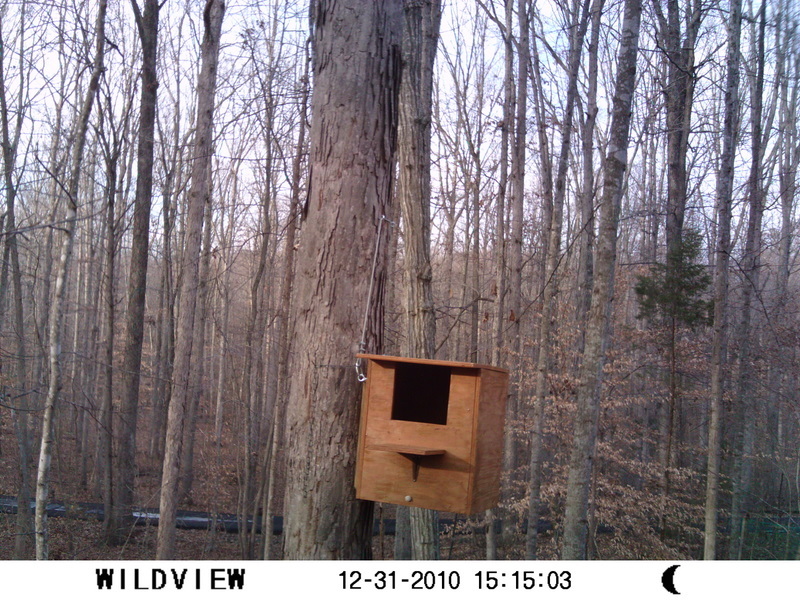 12/17/2010: Finally got around to mounting the Wildview camera about 15′ south of Sandy’s owl box. Hopefully that 2″ black nylon strap is tight enough to keep it in place but not so tight as to worry the tree. No owls yet. Changed the batteries a few days ago, and the memory card, but found no pictures. Today I climbed up to change the memory card again, and just as I got there the Wildview camera took six shots like this one, four seconds apart. Evidently the motion detector is working. Here’s a link to some pictures and information posted on the Cornell website by Dr Richard O. “Rob” Bierregaard, Jr. , the originator of the nesting box plans we followed. 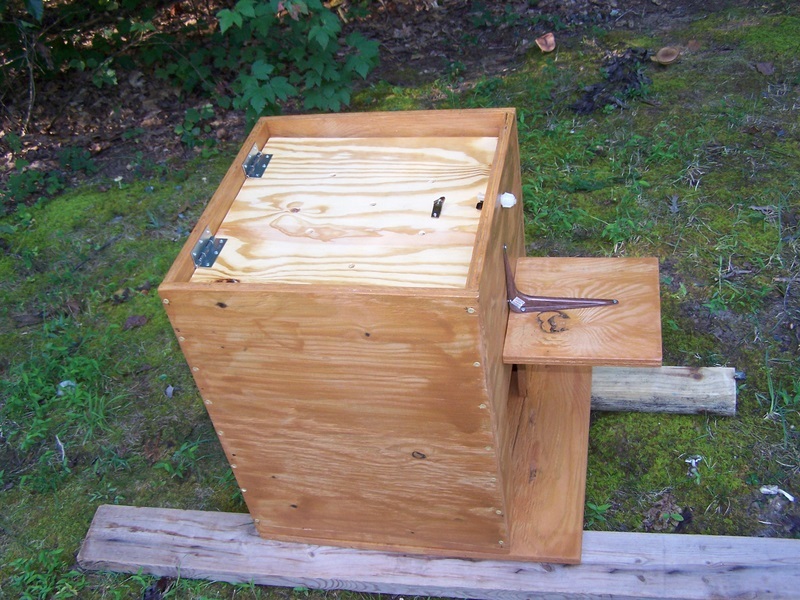 His barred owl project at University of North Carolina at Charlotte has been going ten years. I got out the extension ladder and made my annual visit to the box, expecting to clean out a box full of twigs and possibly a live squirrel or two, as in years past. I used the extension ladder because although it’s a struggle to carry it that far into the woods, balancing myself on tip-toe on the very top of the 10-foot stepladder is a little risky. No twigs or squirrels this year. I had slapped the side of the box upon arrival, but answer came there none. The trapdoor is held shut with a single nylon nut and bolt, so I have to press the door upward slightly to be able to retract the bolt, and yes it did seem rather heavier than I’d expected. It flew open and a heavy ball of fur thumped down onto the leaves 15 feet below. As I gazed down, I recognized the unmistakable raccoon tail and watched the very portly figure stretch its legs and slowly and deliberately amble away. It had made no sound during either fall or impact, and never looked back or up. I thought surely it must be injured. At a distance of perhaps 50 feet from ground zero, it climbed a 5-foot fencepost, perched a moment, then equally deliberately crawled down the other side and disappeared under our neighbor’s garden shed. The raccoon had kindly left no mess in the box. We once again begin to wait patiently for an owl. Here’s the Wikipedia raccoon link. 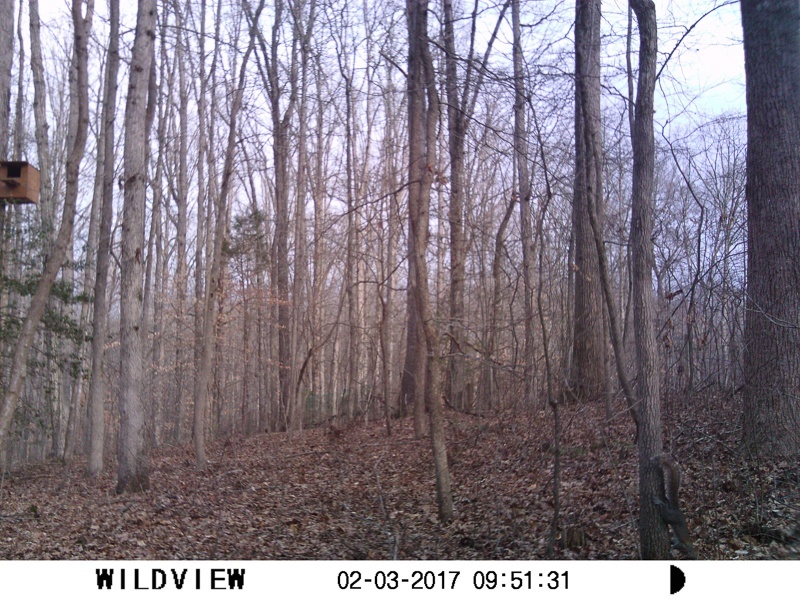 3 Feb 2017: Didn’t catch much with the Wildview camera this month, other than myself going to check the camera from time to time. Had been hoping for a fox I’d seen go this way. But just the one squirrel, barely visible, on the small tree at lower right. 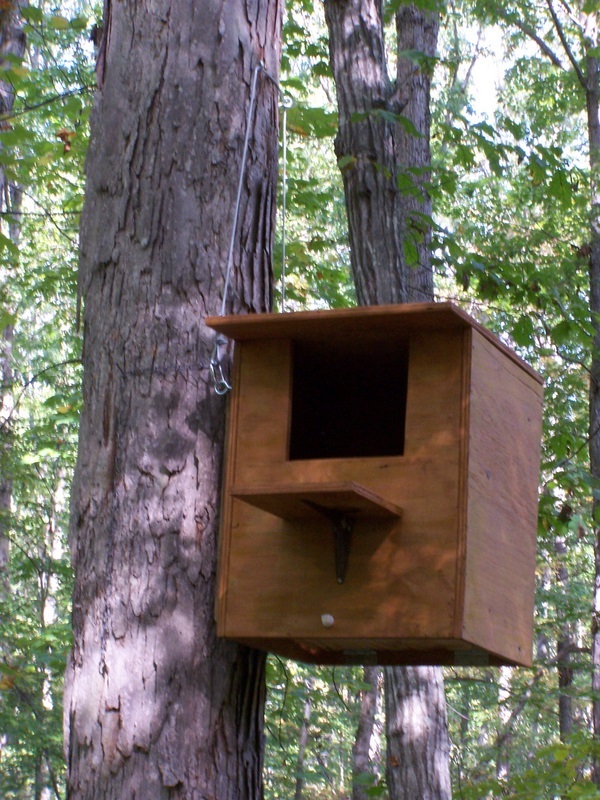 That’s Sandy’s barred owl nesting box at upper left, still owl-less after all these years.